As part of its Healthy Trees, Healthy Kids! 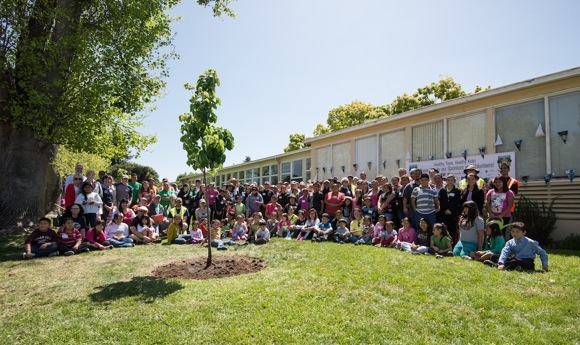 initiative, Canopy engaged a corps of volunteers to plant its 1,000 tree last Saturday at Willow Oaks School in Menlo Park. Launched in 2011, the Canopy initiative partnered with local school districts to plant 1,000 drought tolerant shade and fruit trees on school campuses while supplementing classroom environmental science curriculum. A year ahead of schedule the 1,000th was planted — along with 92 more. It marked the culmination of tree planting efforts at 27 area schools and parks, reaching over 6,000 school children with the help of 1,600 community volunteers. In addition to greening school campuses, the initiative brings environmental science education and hands-on nature experiences into underserved local schools. The classroom lessons provide opportunities for students to make the connection between caring for their school campus and caring for the environment. Canopy will continue to offer classroom lessons and tree care sessions to area schools on an ongoing basis. The Healthy Trees, Healthy Kids! initiative has primarily served the communities of the Ravenswood City School District (RCSD) in East Palo Alto and eastern Menlo Park. Over 80% of the initiative’s young trees were planted on RCSD campuses.